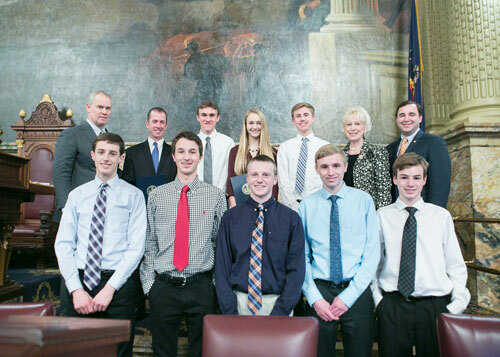 Pictured with Rep. Boback, Rep. Aaron Kaufer (R-Luzerne) and Speaker Mike Turzai (R-Allegheny) are the members of the Dallas High School Boys’ Cross Country team along with Ally Rome, who was also presented with a citation to recognize her achievement of capturing the 2015 PIAA State Class AA Girls’ Individual Cross Country Championship. Ally is a senior at Dallas High School. Members of the Dallas High School Boys Cross Country team include, in no particular order, Stephen Postupak, Josh Jarden, Adam Borton, Jack Zardecki, Jason Culp, Robert Martin, Josh Wyandt and Mitchell Rome. Rep. Karen Boback (R-Lackawanna/Luzerne/Wyoming) presented a citation from the House of Representatives to the Dallas High School Boys’ Cross Country team to recognize their first place finish in team rankings during the 2015 PIAA State Class AA Boys’ Cross Country Championships.